Bleeding Violet begins with Hanna Jarvenin’s arrival to Portero, Texas in search of a mother she's never met, and talking to a hallucination of her dead father. Decked out in nothing but purple from head to toe and accompanied by a pharmacy's worth of anti-depressants and anti-psychotics, Hanna is certain that she's the weirdest thing Portero has ever seen...but she soon learns that she isn't, not by a long shot. She and her mother, who is less than enthused to see her, arrange an agreement: if Hanna isn't fitting in by the end of two weeks, she has to leave. Hanna's determined to stay, but finding her place in a town full of spirits, monsters, and distrusting people may be harder than she ever thought. Bleeding Violet is a truly weird and creepy novel. Much like Buffy the Vampire Slayer's Sunnydale. Portero is overrun with monsters and evil supernatural beings that are bent on harming its unperturbed human inhabitants, and are held back only by the Mortmaine, an unfeeling society of demon hunters with their own agenda. This fact is a bit unclear at first as Hanna isn't necessarily the most trustworthy narrator; between her delusions, mental health issues, and history of violence, it’s sometimes hard to tell if what she is seeing is a figment of her unbalanced mind, or just one of Portero’s quirks. Nonetheless, Hanna is a fascinating character. She is both desperate to be needed and loved by her mother and unable to act appropriately in high school social circles, but at the same time very confident and courageous when it comes to talking to guys and facing monsters. Readers may not be able to fully trust or like her, but Hanna is strong and engaging, and goes after what she wants. She often brags about her sexual experience, but it felt as though that the chemistry between her and Wyatt, the apprentice demon-fighter she sets her sights on, wasn’t anything extraordinary. 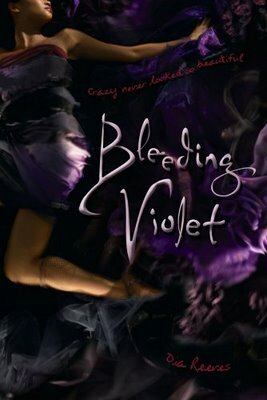 Despite these details, Bleeding Violet is a highly unique paranormal read that keeps you in edge with its bold and unpredictable plot twists and dangers, and mature teens will like Hanna's stark and unforgettable voice. Cover Comments: I really like the purple and the model used on the cover! It's all very mystical and beautiful. I am not a huge fan of the font that the tagline and author's name is in, but that's just a minor detail. All in all, a very nice package! Review copy received from Amazon Vine.